Home > Football, West Ham United FC	> Manchester Utd vs WHUFC FACUP 3rd Round replay. Manchester Utd vs WHUFC FACUP 3rd Round replay. As luck would have it I was working in Manchester the day after this game, so rather than watch on the telly, I ponied up the £45 quid and drove up to the icy Northern wastes of England to my date at Old Trafford. The game started pretty quiet with WHU on the back foot. This is starting to become a worrying trend for WHU, and something stat happy Sam needs to look at. So as expected after nine minutes, Hernandez crosses an easy pass for Rooney to sort out. One nil Man U. Anyway, back to football. The first half played out a bit boring, with WHU looking a bit slow if I’m honest. RVT was bottling in a big way, and as I’ve said before, is not up to this level as yet. Second half was way better with WHU moving the ball about, and Man U attacking in numbers as well. 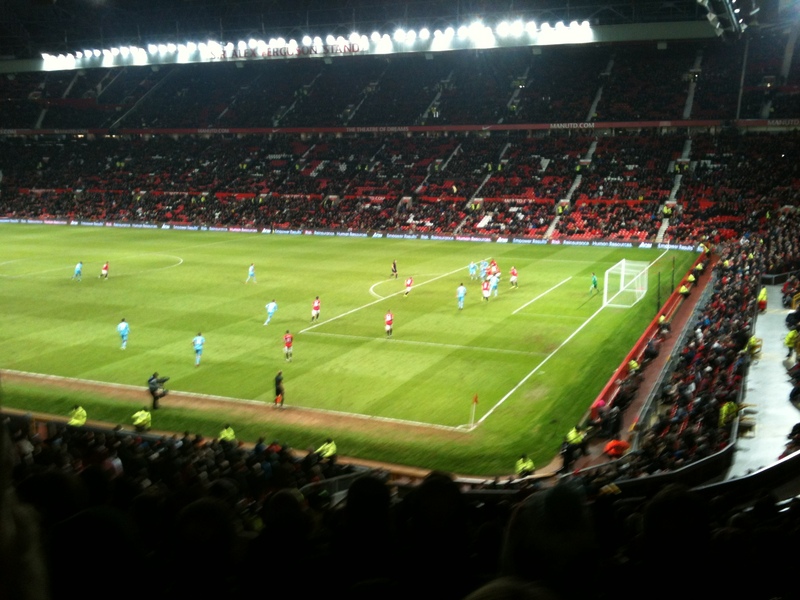 Potts and Spence came into the game well, especially Spence once he realised he could do Buttner 7 times out of 10. CC had a couple of chances and Diame started to get on things in the middle. Even Diarra seemed to be putting a shift in . With about 20 to go Giggs rolled back the years and weaved through the WHU back line to have his cross met by Jordans Spence’s arm. It was ball to hand, but in front of the Stretford end what ya going to do ? So up steps Rooney and takes probably his last penalty for Man U, as he blasts it not just over, but Waddle circa 1990 over. By this time Nolan and Collison were on and WHU smelt blood. For the last 15 we were on top and only some bad choices stopped us getting some shots off, as we were making spaces all over the Utd box. Best chance fell to Matt Taylor who was becoming more influential. All he needed to do was pass to CC (8 ft away) who was clear in front of goal, but he took on a shot that hit the side netting. Fergie noticed he was starting to dictate the game, and so put Paul Scholes on, who made it his first job to chop Taylor in half, and only pick up a yellow, which would of been a red card in any other ground. Not really my style to moan like that, but that’s how it was. Happy to have the debate as i would love to hear the defence ! Just as well he’s retiring again, as this season he is ruining a hard won reputation with fans outside of the red half of Manchester. Elliot Lee made his debut in the last 10. I’m sure Dad Rob will be proud. Anyway, game ends one nil ,and overall not a bad performance from the Hammers, but they really need to sort this 1st 10 minutes business out. The view from the away end in Manchester Village. Never Touched Him Ref !. Absolute joke.